16 Feb 2011: My apologies... but the list below is almost completely out of date. It's rather amazing how quickly things change in this field; many of the companies below have changed hands or ceased production, and very few are still in business. 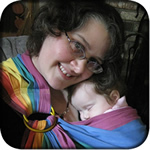 You can still get advice at The Babywearer, and Attached to Baby, Kozy carriers, and Gypsymama (now Wrapsody Baby) are still around, and you can still get a Zolowear sling (but not a double-layer silk) or a Mother's Helper, Sakura Bloom, or MayaWrap sling. But Mamatoto is gone; Comfy Joey no longer makes pouches; Hotslings went out of business, Angeltails, Kiddie Cradles, Eesti, and TenToes closed up shop; and Laughing Starfish doesn't make nursing necklaces anymore. I will look through my contacts in the near future and come up with a more up-to-date list when I get a chance. Looking for more babywearing information? The BabyWearer.com is hands-down the best resource for everything babywearing. Vast forums, reviews of thousands of carriers, and guides to using all kinds of carriers. Plan on spending a few hours browsing. Check out their Article section for tons of helpful information. Mamatoto.org has resources for making your own carriers, including links to my DIY directions. In the UK, you can buy a beautiful, one of a kind sling made with an overlapping pleat shoulder (with my blessing) from Angeltails. She does gorgeous work, and you can avoid the customs fees you'd get buying from me in the US. Alas, she can't ship to the US (insurance limitations), so this is just for you UK folks. Looking for a wrap? Gypsymama has a wide selection, beautiful colors, and top-notch customer service. Wraps are awesome for bigger babies and toddlers, as you can use them on both shoulders, making the baby feel virtually weightless, especially for long outings. Looking for pouches? Hotslings are a perennial favorite with discriminating babywearers everywhere! If their prints aren't your style, I highly recommend Comfy Joey's reversible cotton pouches. I had never really gotten along with pouches before I tried one of them -- they really are gorgeous, very well made, and extremely comfortable. Looking for a mei tai? The Kozy carrier is a classic! Mei tais, like wraps, distribute a child's weight over both shoulders, and they're quite easy to use -- I loved my mei tai for day trips to Boston, when I'd wear my three year old for several hours at a time! For newborns, I highly recommend the TenToes Click -- a mei tai with buckles on the straps, which makes it very easy to wear, and quite secure. My 7-year-old has worn Susan in our Click! Also try Kalea Baby and Eesti Slings -- both are very highly regarded on The BabyWearer, with a shoulder styles that are a combination of pleats and gathers. UpMama! makes a great "hybrid" sling (a ring sling with a sewn-in pouch seat) and a comfy shoulder. The Sakura Bloom site has many beautiful double-layer dupioni and linen slings with a gathered shoulder. They have garnered high praise at www.thebabywearer.com for their comfort and style. Looking for a truly one-of-a-kind carrier? You can buy dyed wraps, or send a wrap to be dyed, from Piece of Cloth. Jenn does a gorgeous job of dyeing wraps and has a ton of experience. A dyed wrap can become a stunning ring sling -- I would recommend having the wrap dyed first, so that I can match the ring and thread color to it, but I can also send her completed slingified wraps to be dyed after the fact. Looking for a one-stop shop for everything babywearing? Then you must visit Attached to Baby -- fantastic selection of every type of baby carrier, forums, lots of pictures, and the best customer service I've ever encountered. You can't buy a sleeping baby productions sling there, but you can find just about everything else! For beautiful, exquisitely-made, functional, and affordable nursing necklaces, check out Laughing Starfish Jewelry. I just got two gorgeous pieces from Dorota -- she's a real sweetie, and her work is stellar! Looking for ways to entertain your older children? Check this out: "Our Camp, Our Children" -- a book detailing the process of starting your own neighborhood or group camp, with activities and the like. Fill out the print order form and get the special price $5.00 (including shipping and handling). Offer does not work on orders placed online.The book targets kids 2-6 years old. And of course, there's the book that started me on my babywearing journey: the Sears' The Baby Book, which is for all practical purposes an attachment parenting bible. I lived for Stephen's first 6 months with this volume at my bedside; it was a constant reference for me as a first-time mother, and I wouldn't be half the mother I now am without it!